Glenn Branca was an American composer and guitarist who debuted with Lesson No. 1 (above) on cult label 99 Records in 1980. His earlier music was performed in no wave bands of the late 1970s, namely The Static and Theoretical Girls. This entry was posted in American culture, art, music and tagged avant-garde, guitar, noise on May 16, 2018 by jahsonic. Adam Parfrey was an American writer, editor, and publisher whose work centered on unusual, extreme, or “forbidden” areas of knowledge. 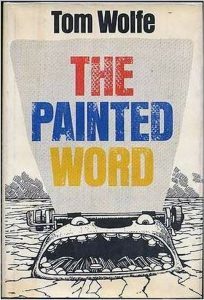 He is perhaps best known for Rants and Incendiary Tracts (1989), which he co-edited with Bob Black. 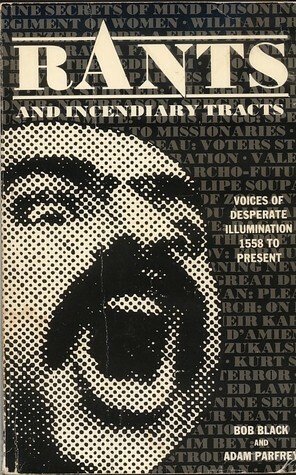 Rants and Incendiary Tracts (1989, above) is an anthology of 56 pieces of invective in the style of An Anthology of Invective and Abuse (1929) by Hugh Kingsmill. By the way, can anyone illuminate me on the cover photo of Rants? This entry was posted in grotesque, literature and tagged American culture, English, radicalism on May 11, 2018 by jahsonic. Reading Roger Scruton’s “Flesh from the Butcher” for my thesis I noticed the word Tafelmusik. My encyclopedia brought up “Tafelmusik für König Ubu“. Anything with the word Ubu in its title piques my interest. “Tafelmusik für König Ubu” appeared to be a German version of Musique pour les soupers du Roi Ubu (1966), a musical composition by Bernd Alois Zimmermann. I played it [above], it’s wonderful, it’s a sound collage. Not really. It’s a musical composition filled with quotations. The next track [above] starts very sweet and gentle. At 4:55 the most wonderful waltz waltzes in. Waltzes have these pauses that remind me of weightlessness. The composition appeared to be “Der Waltzer (1969) by Alfred Schnittke. I ended up listening to Alfred Schnittke’s music for most of the weekend. 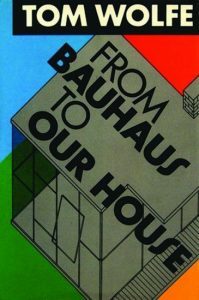 This entry was posted in aesthetics, European culture, music on May 2, 2018 by jahsonic.